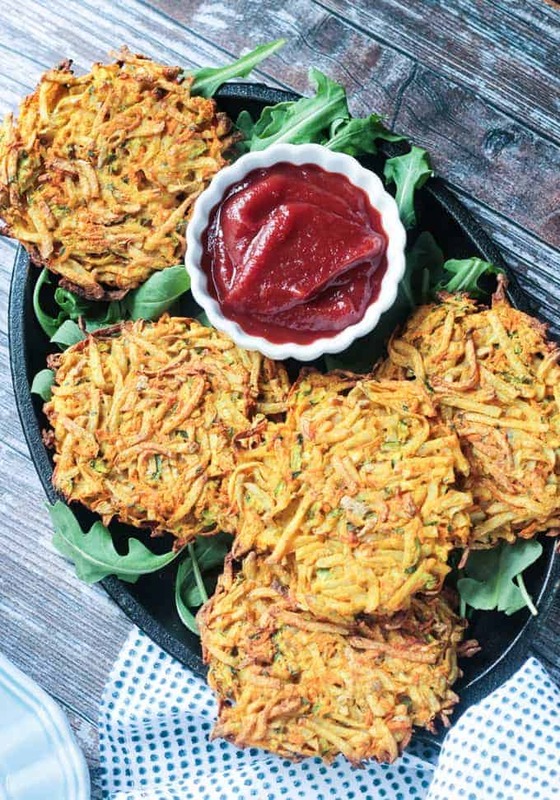 Veggie Potato Fritters – Crispy oil free fritters that are baked, not fried, make a perfect easy side dish or snack. Potatoes. They’re a staple in nearly every household I know and in cuisines around the world. You’re almost guaranteed a side of spuds in some fashion if you’re eating out here in the U.S. Baked potatoes, roasted potatoes, mashed potatoes, fried potatoes, french fries, tater tots, potato salad, potato soup, potatoes au gratin, potato skins….I love ’em, you love ’em, kids love em, everyone loves ’em.! Today, we are loving them fritter style! Crispy on the outside and tender on the inside. And we’re doing it all with just a few ingredients and NO oil! Potatoes sometimes get a bum rap, but they are actually incredibly healthy. They’re low in calories, high in vitamin C, potassium (more than a banana! ), B6, fiber, and antioxidants. They’re also fat-free and contain no sodium or cholesterol. 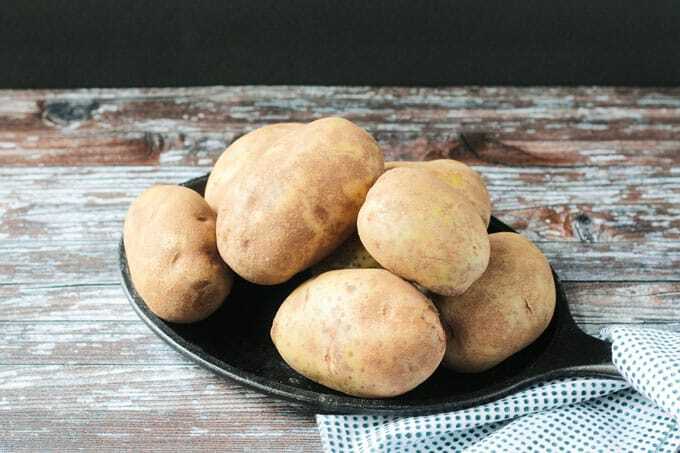 The problem is not with the potatoes themselves, but with the way in which they are traditionally served. Good news – this potato recipe today is full of healthy whole food ingredients and baked with no oil! The potatoes I buy most often are Russet Potatoes. They are so versatile – perfect for baking, mashing, roasting, or frying. They’re mild in flavor which makes them the perfect canvas for all kinds of toppings, herbs, or spices. 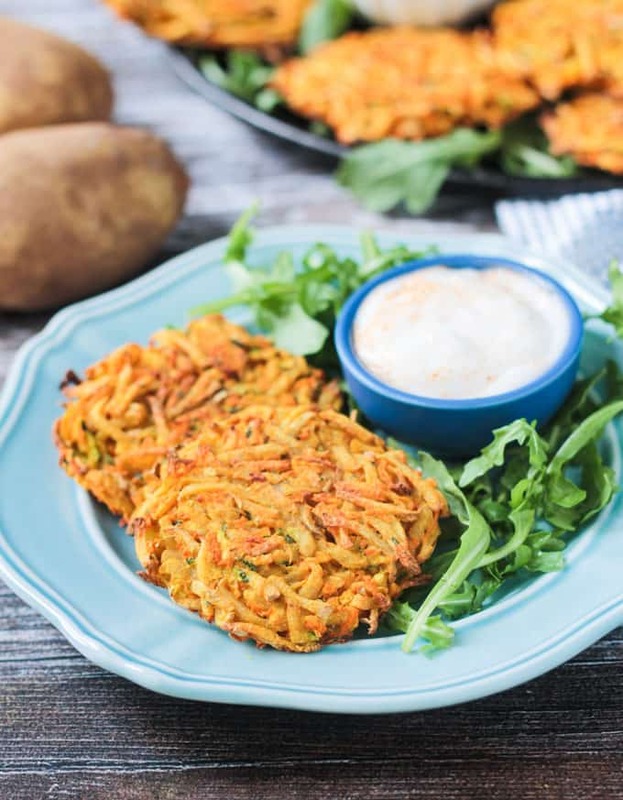 In this potato fritters recipe, we are shredding them along with zucchini and carrots, adding just a few spices for flavor, and baking them until the edges are wonderfully crispy. No need to spend time peeling the potatoes. The peels have loads of nutrition in them, so don’t throw that away! Just make sure to scrub them really well. Baking these potato fritters on parchment paper means we don’t need oil to keep them from sticking! Usually, eggs are used as a binder in fritters, but of course, we’re not using eggs today. I tried a couple of different eggless binders in this recipe and my favorite by far was chickpea flour. Other flours I tried left the fritters a bit gummy in the middle – definitely not the texture we want in our potato fritters. Chickpea flour has great binding capabilities and has the bonus of being naturally gluten free and high in protein, fiber, and iron. Use leftover chickpea flour to make these quick and easy, super flavorful Falafel Burgers! 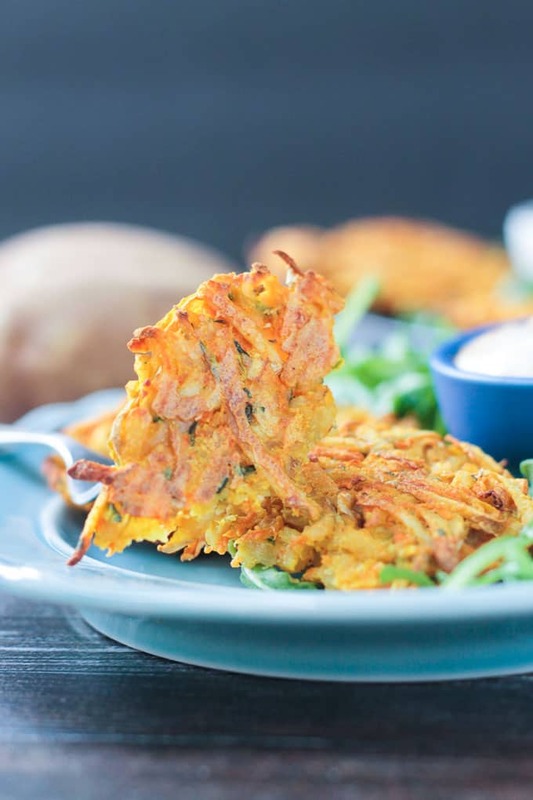 The Veggie Potato Fritters make a delicious side dish or snack. They would also be perfect for breakfast next to a Tofu Scramble or veggie sausage. 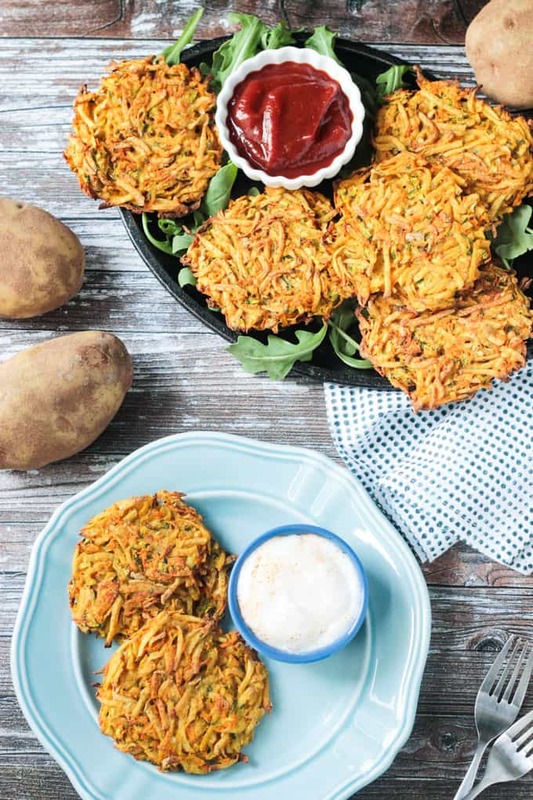 We served them up with a side of spicy smoky ketchup and cooling dairy free plain yogurt (similar to sour cream which is traditionally served with potato latkes). Grab your favorite dipping sauce and make these crispy fritters today! And for more recipe inspiration featuring tasty spuds, be sure to check out Potato Goodness. I hope you love these Potato Fritters as much as we do. If you try them, please come back and leave me a comment below with your feedback and star rating. You can also find me on social media. 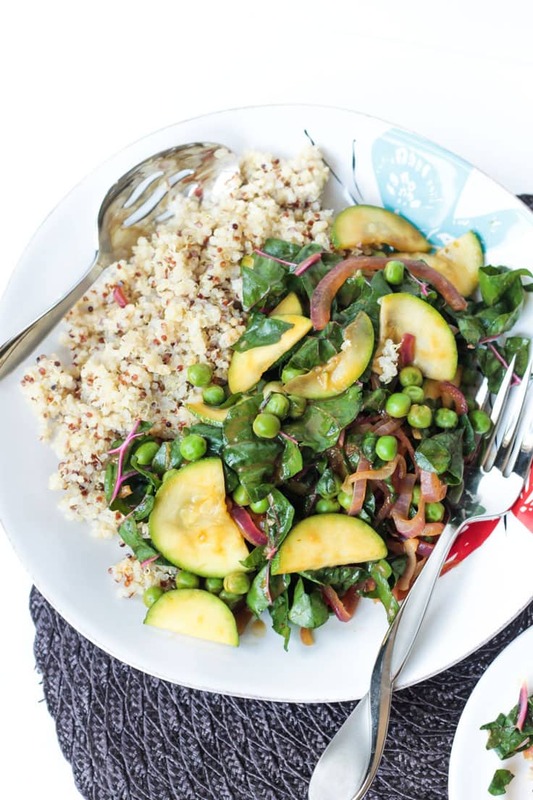 Be sure to tag @veggie_inspired and #veggieinspired so I’m sure to see it. Enjoy! Veggie Potato Fritters - Crispy oil free fritters that are baked, not fried, make a perfect easy side dish or snack. 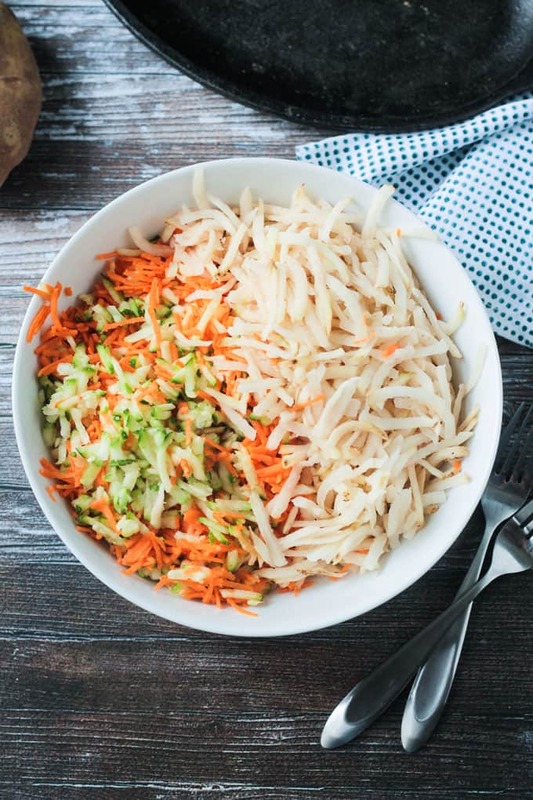 In a clean kitchen cloth, very sturdy paper towels, or cheese cloth, squeeze out the liquid from the shredded potatoes and zucchini. Really put some muscle into it and just when you think you've squeezed all the liquid out, squeeze a little bit more! This will get rid of most of the starch from the potatoes and the liquid from the zucchini so that the fritters will bake up nice and crispy! DO NOT SKIP THIS STEP! Add all the ingredients to a mixing bowl and mix well to combine. Taking about 1/4-1/3 cup of the mixture, form it into a thin patty shape with your hands. Place it on the parchment lined baking sheet and press down slightly to flatten. Repeat with the remaining mixture. Bake for 20 minutes. Gently flip the fritters over. Bake another 10-15 minutes until golden brown on both sides and crispy on the edges. 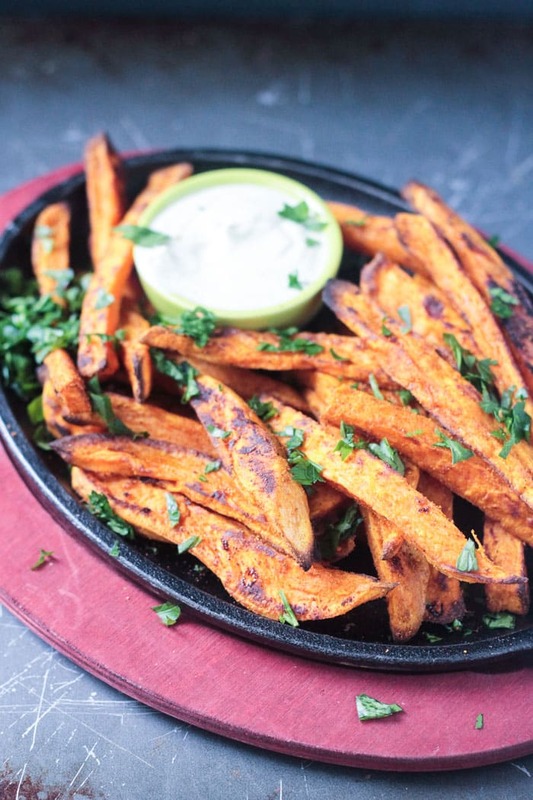 Serve with Spicy Smoky Ketchup, vegan sour cream or plain yogurt, or your favorite dipping sauce. No need to peel the potatoes - just make sure to scrub them well first. I prefer using the large holes on the grater for the potatoes and zucchini, but the small holes on the grater for the carrots. I also find the fritters hold together best with this sizing. For more potato recipe inspiration, be sure to check out Potato Goodness on Facebook. Could we use Almond flour instead of chickpea? Hi, Chelsea. I tried them with almond flour and the texture was a bit gummy in the middle. It will work in the sense that the fritters will stay together, but I think chickpea flour gives them the best texture. I add cheese and green peas to mine, so perfect and yummy. My family and friends always ask for more. Just attempted and they completely stuck to the parchment paper leaving no crispy parts. Sad day. Hi, Riley. Did you squeeze out all the liquid really well from the potatoes and zucchini before you formed them? Look great! If I wanted to put egg in instead of chick pea flour, how much? Hi, Marie. I would say one, but since I’ve never tried it, I can’t say for sure. You don’t want it too wet though because then they’ll get soggy instead of crisp. Let me know if it works. Hi, do you think i could sub pumpkin for the zucchini? Puréed pumpkin? No, I don’t think that would work. They would likely be too soft and not get crispy. Came across this recipe hunting for lunchbox ideas for my egg and dairy intolerant baby as she’s starting nursery soon. Would they be OK cold or would they need reheating? Do you know if they freeze – and again would they need reheating after defrosting? Hi, Nessa. I didn’t try them cold straight from the fridge, but they are great at room temperature, so would be perfect for a lunchbox! I would imagine they would freeze great, but I haven’t tried it. For reheating, I would suggest using the oven or a toaster oven or even a skillet. I think the microwave would make them mushy. Enjoy! These look amazing, and I love that they’re baked! Frying can be so tedious and messy!!! Yes, I always get splattered and burnt by oil when attempting to fry. Thanks, Sarah! Ooh, it is fritter season! These look so warm and comforting. I love that they’re baked and oil-free too! Thanks, Alisa! We have been loving them! I’m game for anything called a fritter! And spicy ketchup is my FAVE. There is a place over here where you order fries and pick 3 dippers and I always get the spicy ketchup! Oooh, that place sounds amazing! I could make a meal out of that! Oh my word – they look amazingly delish! I thought for sure they’d be fried, but I am super excited to know that you bake them. You’ve really got me excited about trying these. Thanks, Trinity! They’re even easier than fried because you don’t have to stand over the stove with oil spattering about! Oh yes! Just pop them in the oven and walk away – love it. I love Love LOVE any and all potato recipes! these look crispy good! Me too!! Soooo good! Thanks, Kristina! I just made zucchini and carrot fritters last night! I didn’t add potatoes, but will try this recipe next time. YUM! That sounds yummy too! Thanks, Linda! Ooo they look so crispy! Love that they are oil-free! OMG, YUM! These look so good- and are such a great alternative to the same old sides my family always gets. Totally need to try these! Thank you, Karly! I hope you love them! I do think potatoes are so versatile as there’s so many ways to you can cook them. I especially like how crispy you’ve managed to get these. They look so so tasty! Thanks, Corina! Crispy potatoes are the best! Potatoes are so delicious, and you’re right, a big part in many meals. These fritters look really tasty, and would be great with all kinds of meals. A good way to have tasty potato without the fat or oil. Thank you. I agree – they would be delicious with so many meals! 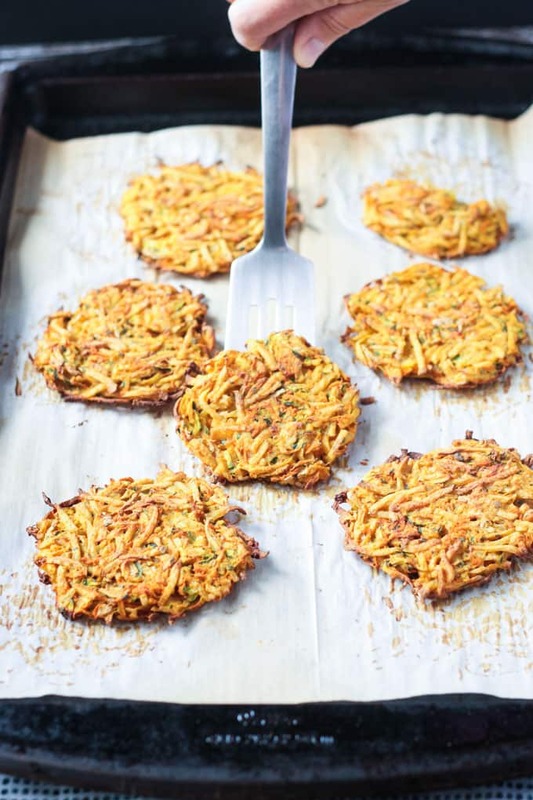 I love crispy baked veggie fritters! The combo of potato, carrots, and zucchini with those spices sounds so delicious! Going to save this one to try! Thank you, Maria! I hope you enjoy them! I just love that these are baked instead of fried. What a great way to increase your veggies. Super easy to get extra veggies in there too! Thanks, Dannii! Wow! Those look amazing. My favorite vegetables and they look like their fried not baked. Love your spices and I’ll be making these very very soon. Thank you, Ginny! Let me know how they turn out! I love fritters. What a fantastic idea to bake them with no oil. I’ve made fritters so many times but I’ve never baked them. I’m going to make these on the weekend. My kids are going to love them too! Thank you! I hope you all love them! These fritters sound wonderful! I love how you snuck in some extra veggies too! LOVE sneaky veggies! Thanks, Nicole! Oh my gosh, these look so good! I love all of the veggies packed in there. I love that these are baked. I always get splattered with oil when I try to fry things like this, plus baking is so much healthier. I look forward to trying them! Thank you for taking a stand for the potato! I’m so tired of people bashing them, since they are nutritious. And thank you for this amazing recipe! I can’t wait to try it. HaHa! All hail the potato! Thanks, Dianne! Hope you love them!